If internet reaction is to be believed (spoiler alert: it’s often not), making Peter Parker the CEO of his own company was not a popular direction for the character. 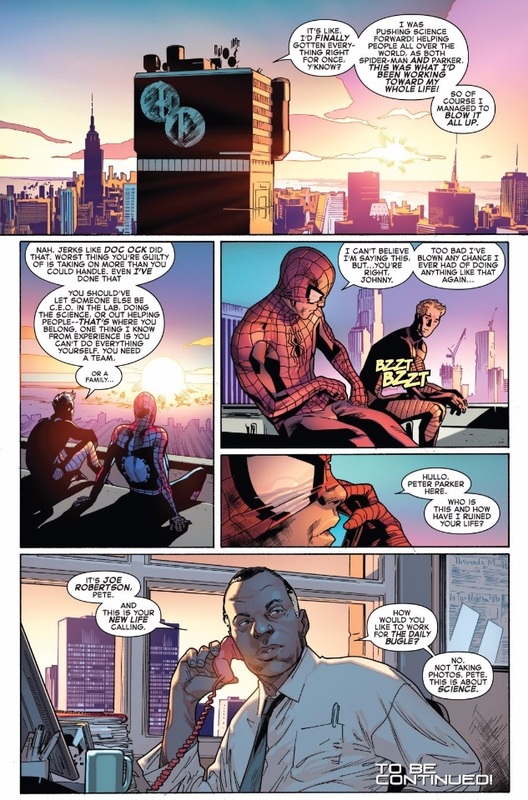 I’ve seen complaints that the stories just “didn’t feel like Spider-Man,” but I’ve never agreed with that — those adventures were writer Dan Slott pulling off what so many creators try and fail to do, respecting the core of a character (“with great power must also come great responsibility”) while finding new ways to express and progress those intrinsic traits. My biggest fear about “Legacy” and the death of Parker Industries has been that Peter would regress, and while he does seem to be taking a few steps backwards as he deals with the loss of his company, in Amazing Spider-Man 790 Slott and Stuart Immonen show that they’re still interested in moving Peter’s story forward and finding ways for him to grow as a person. 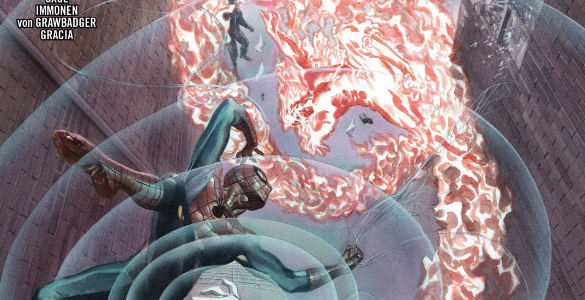 Other than his (understandable) sulking and general loss of direction in the aftermath of PI’s destruction, the greatest step backwards for Peter is his knock-down, drag-out brawl with Johnny Storm in the former Baxter Building. It’s a mirror to the battle they waged when Peter first bought the building (now he’s selling it), but it’s certainly not a flattering one — I don’t want my heroes to be perfect, but petty squabbles like this one (which also rack up thousands of dollars of property damage) live down to the worst perceptions of superheroes and comic books both in-universe and out. And although Harry doesn’t know Spider-Man is Peter Parker, it’s still Spidey’s recklessness and Peter’s complete apathy to it that sends Harry packing, losing Peter one of the few true allies he had left. Peter continues to sink lower, and I’d say that in many ways he finishes this issue in an even worse place than he began it. Yet, through it all there’s a light of hope — a moment of growth. Joe Robertson’s phone call is just the stroke of good luck Peter needs right now, but what truly satisfies me as a fan are those second and third panels. Peter made his fair share of mistakes running Parker Industries, but now he’s learning from them. He’s finding out where his true strengths lie, and he’s not running from those lessons. They’ll serve Peter well wherever he lands next, and the fact that Slott and Immonen are still looking for ways for Peter to grow and learn instead of just regressing him back to his classic status quo make me one happy fan. Consider my “Legacy” fears quashed. While I can’t comment on the comic specifically, just want to say I agree 100% with everything you say here in the abstract. And I had the exact same fear about Legacy’s effect on Spiderman, and glad that Slott actually has a plan for growth and moving forward.